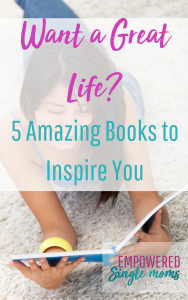 5 books to get you out of your rut and on the right track to having a fabulous life. to stuff another book. I am embarrassed to say I even have a shelf in my garage with books. Then I discover it, the solution to my book clutter problem. The solution is Audible and the cool thing is you get 2 free books just for trying it. I discover the solution to my book clutter problem. The solution is Audible and the cool thing is you get 2 free books just for trying it. I discovered the solution to my book clutter problem. The solution is Audible and the cool thing is you get 2 free books just for trying it. In case you aren’t sure what to choose for your free books I have some ideas to inspire you. This post contains affiliate links, which means that if you buy a suggested product I will earn a small amount of money to support my book buying habit. Read the full disclosure policy here. in a couple of Facebook groups, I am in, when a friend said it was on Audible I downloaded my free copy. This book has already helped me improve my productivity. It is elegantly simple which is what makes it so useful. I can’t believe I didn’t think of this. Live Save Spend Repeat is not officially available until October 1, 2017. I was able to snag my copy in an early release on Audible with one of my free credits. This is an amazing book. I expected it to give me some motivation to upgrade my budget habit since I have fallen off the budgeting train recently. It is so much more than that. this book gives you a roadmap to set life milestones to live the life YOU want to live, not someone else’s life. Another surprise for me was how Kim ties using a budget and setting goals with strengthening your spiritual life. I was able to get all this inspiration during my regular walks, which also kept me motivated to walk, which I also need help with. She has worksheets on her website livesavespendrepeat.com, so you do not miss them if you are listening to the book. Several years ago I read Mark’s book Draw the Circle: The 40 Day Prayer Challenge. His story is inspiring to the point of sounding unbelievably magical. It is a great reminder that God answers prayer when we are willing to step out in faith. If you need some stories of inspiration and to reignite your faith this book is definitely the one you want. He gives you one manageable assignment a day for 40 days. I read You are a Badass a couple of months ago and loved it so much I started reading her new book, that you can check out here. Sincero inspires us to stop listening to our limiting beliefs and live in our brilliance. Try Amazon Prime 30-Day Free Trial this is an even better way to try Audible, because you get 2 free Audible books with Amazon Prime, plus free shipping on Amazon purchases, and free music streaming. If you could have 2 books for free, which two would they be? Would you choose one of my favorite inspiring books or are there two others on your “books I want to read list”? Tell me below, so I can put them on my list.